This entry was posted on Thursday, October 28th, 2010 at 9:50 am and is filed under Young Americans: 1975. You can follow any responses to this entry through the RSS 2.0 feed. Both comments and pings are currently closed. Your photo illustrations just kill me. So well thought out, so immediate, so I don’t know, but they are so yes. Spirit, not letter= win. 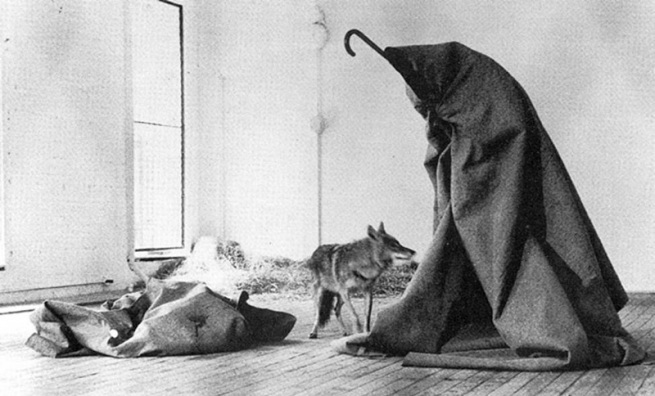 Seeing this one, Beuys w/ Coyote just made me have to write and be-kudo you. Ha – I am listening to Lodger as I write and realised that “Boys Keep Swinging” is on now. Oh Universe, you are such a wag. Good little track, somewhat underrated. The photos on this whole blog are totally awesome. I just saw Francis Whately’s superb 2013 documentary, David Bowie: Five Years. A fascinating highlight is singer Robin Clark recalling how the complicated call-and-response chorus of Right was put together. Don’t miss it. Poll! This is the one … Yes, this is the #1. Revisiting this topic (apparently) whilst listening to YA ,and was as delighted / surprised to see the Beuys image this time. Was further surprised to see that I’d already talked about it -had completely forgot. Anyway, one thing I hadn’t notices was your brilliant Bowie/Beuys homophone on top of everything else.